Watch me make these Black-Eyed Peas from start to finish! Happy 2018 yall!!!! I’m finally feeling better after having no real voice for over three weeks and struggling with that crazy bug from hell! I seriously feel like running a marathon right now. Man, health is such a blessing huh? I take it for granted often, but this sickness has made me reflect on things. I’m glad to be back. Although my voice is still shot (as you can tell in the video), I’ll take whatever I can get right now! I missed blogging so much! Geez, I had no idea how addicted I was to you guys! Since a new year is right around the corner, I figured it was time to update my black eyed peas video! Anytime I update a video I usually change a few things about it. 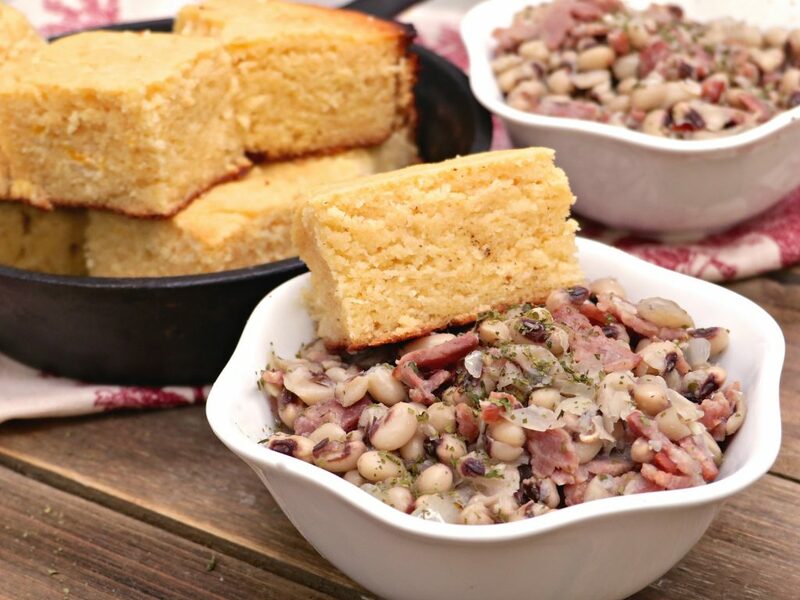 This black eyes peas recipe uses bacon instead of smoked turkey legs. I also decided to do an overnight soak of the beans. If beans make you gassy, then I highly recommend soaking them, although, for my family, I usually don’t since they don’t affect us that way. 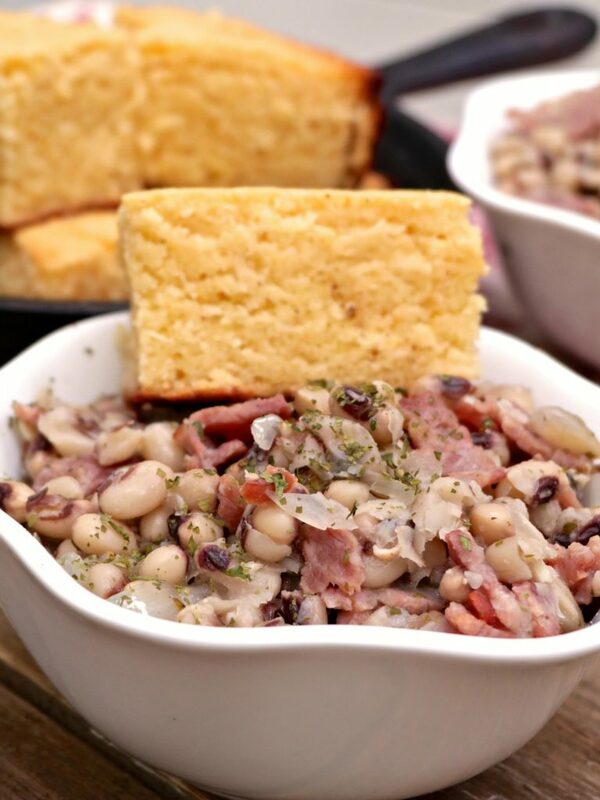 These black-eyed peas are so easy to make! The chicken broth adds excellent flavor so don’t substitute it with water! If you have smoke salt on hand, use a low-sodium chicken broth and finish it off with some smoked salt. Talk about delicious!! Douse those bad boys with hot sauce and a thick square of buttermilk cornbread on the side and baby; you’ve got something on your hands! New Years is pretty much the only time I make black-eyed peas. I love them, but for some reason, I only remember them around New Years. I know I’m not alone with this. 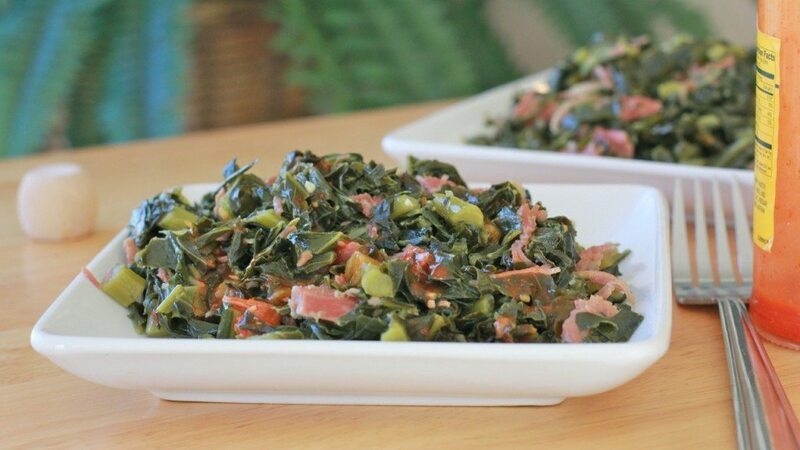 If you’re looking for some good southern style collard greens to complete your New Years menu, then check out this recipe! They are pretty addictive! Cheers to a fun, HEALTHY, prosperous, adventurous, safe and productive year for us all!! Place peas in a bowl and cover with water. Soak for 6 hours or overnight. Drain and rinse peas. Set aside. In a large skillet over medium heat, cook bacon until crispy. Drain bacon on paper towels, while leaving about 1-2 Tablespoons of bacon fat in a pan. Add onions to the pan and cook until translucent. Add in garlic and cook until fragrant. In a large pot, add soaked peas, onions, garlic, and chicken broth. Add a bay leaf and red pepper flakes. Reduce heat and simmer just until peas are tender about 20-30 minutes. When peas have reached your desired tenderness, add smoked salt and black pepper to taste. Garnish with parsley and a few dashes of hot sauce. When do you add the bacon back to the pot? I used your recipe to make black eyed peas for the first time, and they tasted FANTASTIC. They were so good that I’m making them again less than a week later. Thank you for being so generous and sharing your videos and recipes with the rest of us wanna be Divas!